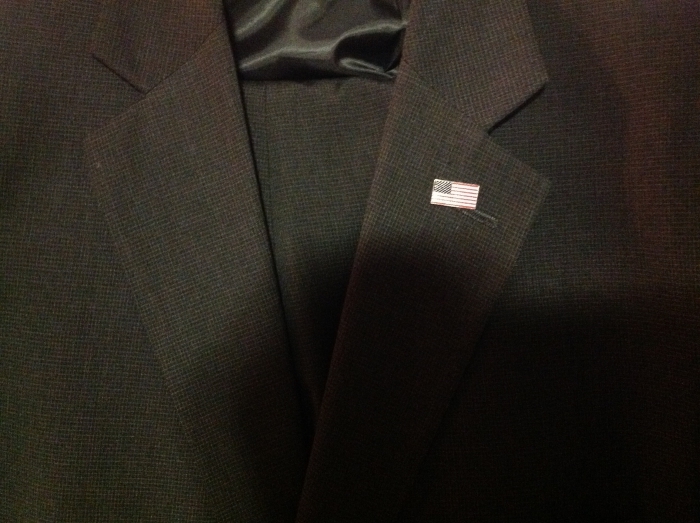 Buy this Patriotic American Flag Lapel Pin and display your American pride. Made from die struck brass, plated in gold, enamel color filled, and epoxy coated for added protection. Each pin includes a clutch back and is individually poly bagged. Designed in the USA, imported. Pin measures 3/4" on the long dimension. I ordered some of these flag pins and they are very classy. Not too big, they were actually smaller than I was expecting. However, after using them I actually like the size. They are high quality and look great. Best UsesLooks great on business suit or professional use. Very high quality item & fast shipping too! it would have been nice if the pin include a second smaller pin included to help keep the pin in place without moving in a circle. Purchased pin to replace old "wavy" flag; WOW! Very profssional and not overbearing to suit or uniform. Will purchase a few more before July 4 for coworkers in my division. Very very nice product. Quality made. Well made, good looking American flag pin. I give them out to my good friends and they love them. I purchased 20 of them and I'll be back soon to purchase some more. I purchased a few of these flags not long ago for uniform wear. Many of us wear flags 1/4 inch above our badge. I don't brag very much but I have the nicest of all flags on my uniform! Best UsesGreat for above badge if your department allows or to show your pride by wearing with any attire.